One of the more fascinating group of Australian Native Orchids are the Caladenia Orchids. They are not widely grown in cultivation, are difficult to find in the wild, yet are a very attractive orchid, well worth more attention. Caladenia Orchids (syn Arachnorchis Orchids) are a group of deciduous terrestrial native orchids also referred to as ‘mantis orchids’ or ‘spider orchids’ and are characterised by the long filments. Growing from an underground tuber they generally flower in spring after winter rains have prompted them into growth. 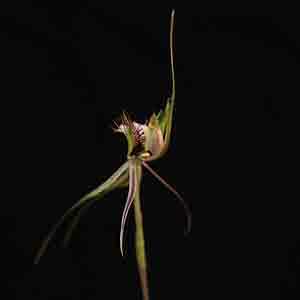 So yes they have been renamed with all Arachnorchis species now being Caladenia Orchids. Although the majority are found in Western Australia, these fascinating orchids are also found in other states including South Australia, through Victoria and NSW to Queensland. Around 35 species are found in Tasmania including C. saggicola. With such a wide distribution, a lot of variation in growth habit and flower form is found in this group. All species are characterised by upright stems with one narrow leaf. The flowers do vary in form, some with very long sepals and petals and these are often called ‘Spider Orchids’. 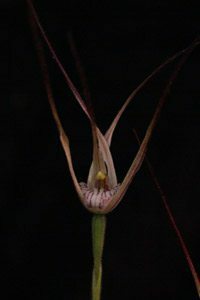 Some have smaller less extravagant flowers and many are called ‘finger orchids’ such as Caladenia mentiens which earns itself the common name of ‘Lesser Fingers Orchid’. All species are deciduous and will die back to small underground tubers. 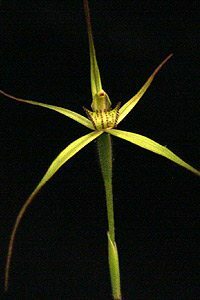 Caladenia polychroma from Western Australia is known as ‘Josephs Spider Orchid’ see picture below. Like many native Australian Orchids they are found in open heathlands and woodlands. Caladenia tensa is the ‘rigid spider orchid’ or ‘greencombe spider orchid’ and is found in South Australia through to the plains of Western Victoria. Caladenia tentaculata (picture right) is one of the larger f;owering species and is found from South Australia through to Victoria, like all of the species a well drained soil is essential for proper care. 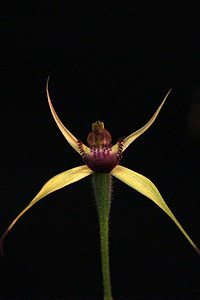 If you are interested in Caladenia species it would be well worth joining the Australian Native Orchid Society, a wealth of information, very interesting flower shows, often with a variety of species for sale that you may well find nowhere else. No Vendors for Caladenia orchids at present.